Fashion industry is witnessing a skewing point since 2-3 years as almost 50% of the purchases are done online because majority of the consumers’ preference has shifted towards online shopping. The retail business is going through a crunch with rising competition, delayed effects of the 2007-2008 economic fallout, growing rents, middle-class squeeze and series of bankruptcies filed by many retailers among other services such as e-commerce, experience-spending etc. There has been a pall on retailing from more than eight years now and it has been continuing ever since. More than half of the U.S. shopping malls are estimated to be closed by 2023. The only stores that are thriving today are mostly the ones with the services that cannot be replicated online. In the United Kingdom, the year 2018 observed the disappearance of more than a thousand stores from its streets. The fashion retailing was the largest business category that was affected totaling to around 10 percent of the total number of stores that were closed. Those included the popular New Look, Topshop, Next, Marks & Spencer, Miss Selfridge etc. This was attributed to window-shopping-gone-easy that came as a result from the perks of online shopping with the majority of people shifting towards this form of leisure home spending. Nearly, one fourth of the fashion spending is done online and collectively, the clothing and footwear have garnered over £7 billion of the sales in the last five years. The slow growth of the offline retail as compared to the online retail is estimated to be the major reason behind the retail collapse in America. In contrast with the announced termination of around 2,500 apparel stores, there were announced store openings of higher than 850 apparel and 90 Jewelry stores. As of August 2018, more than 100 Millions of square feet of the retail closures were announced due to terminations of some of the America’s most noticeable retailers. Thousands of stores of the major chains such as Victoria’s Secret, Sears, Macy’s, J.C. Penney, Toys R Us, Abercrombie & Fitch, Guess etc. have been laid-off. With more than 6,500 announced store cessations in 2017, around 2,500 and 730 among them were of Apparel and Footwear, whereas, the jewelry store closings crossed 160. Continuous growth of online stores with consumers’ preference towards buying goods online with each passing year. 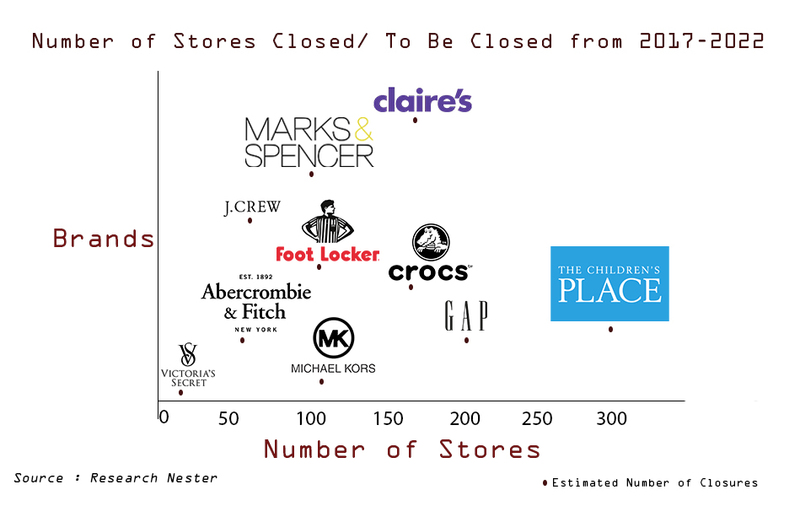 Slow growth rate of store openings as compared to the closure of the stores. The long-established and renowned stores are overloaded with debt. Profit squeeze due to mounting business and import rates. Inclination of people towards spending on experiences rather than materialistic things. Absence of understanding data analytics and implementing strategies concerned with the needs and behavior of the customers. Lack of real salary growth resulting in the declined spending ability of the shoppers. After declining profits in contrast with the competition from the growth of online retailers and intense rivalry between the leading companies, important decisions have to be made to rebuild the brands in loss such as aiming to sell the products at its original price by reducing the need for discounting and bringing the latest trends into the stores before the rivals. The top most lingerie brand of United States, Victoria’s Secret has changed drastically over the years that have resulted in its downfall. Not only the rising competition from American Eagle Outfitters’ Aerie brand has affected the growth of the brand but also its discontinuation of various apparel categories along with reducing the promotions and free offers has led to the disappointment among the loyal customers of the brand. Despite the decreasing sales and closure of around 20 of its stores in the U.S., the brand is trying to bring more people to the stores and maintain its brick and mortar business. Similarly, Marks & Spencer came up with a five year plan aiming to cut the excess selling space that includes- closures, relocations, restructuring and remodeling of their stores along with changing the way they deal or trade both online and offline. The recovery plans may have limited scope of success or may be not at all or it might be a temporary solution, but to be really out there, the fashion brands need to be at speed by understanding the changing needs of the consumers with respect to ongoing trends and bring it to their stores without any delay. The growing number of empty shops, spaces in a mall or the mall itself has provoked fear among the property owners that has also raised concerns about the role of these places in future. To bring forth the interest of consumers; marketers will have to up their game. Not only it requires the enhancement in services to woo the consumers, it also requires talent and creativity of the whole team to push their limits and achieve the unexpected. It takes an ecosystem of data, both qualitative and quantitative to understand the business strategies that are required to excel in this business. It takes no genius to understand the importance of data analysis to discover the useful information required to stay one step ahead in the fashion industry. Fashion is all about staying up-to-speed with decision making and changing the game which requires them to keep up with the transformation which now comes handy with the digital disruption. Yes, you read it right! We believe every business should embrace digital disruption. Only keeping an open mind about it will help them to evolve and understand the consumer requirements and in return, hone the services of their brand as well. As much as the term disruption is misconceived and mostly confused with the term ‘disruptive technology’, many business owners do not understand the magnitude at which the digital disruption can impact their business. This often leads to the failure or being left behind in their business. There are far more possibilities if they take this risk which can help them to shake their shares up in the fashion industry. Research Nester encourages the diversified ways of thinking and believes in implementing the strategies that are best needed to bring back the importance of brick and mortar stores. Based on our reports, there is an estimated sustainability of these stores because the shoppers still value the physical experiences as they can see or touch the products before purchasing. Our research can help you strategize and sustain in your business facilitated by the gain indicators behind the growth in fashion industry in upcoming years. It covers a wide range of studies. Some of them include; helping you to understand the consumer behavior with its dependency on latest trends; why is it important to stay ahead of your rivals and provide the products at an exact point in time, how to satisfy the customer needs, why consumers are driven towards ‘experience spending’ and are adopting cruelty-free products, importance of launching products without any delay, points to be considered before investing such as quantity, quality etc. and how to take advantage of the perfect blend of fashion and technology in today’s fast paced and ever evolving world. With technology taking over almost everything, the retailers are predicted to enhance customer services and feed their need for ‘newness’ with the help of artificial intelligence and augmented reality. Backed by our evaluation on customer demand combined with their experiences and our knowledge in company voluntary arrangements (CVA), we not only assure that you will attain your profit margins but we will also help you to set a standard for your future growth.